Where are you planning your next holiday? Sunny Spain? Continental France? Both lovely in their own right, but you've got to admit, it is a little predictable. I mean, everybody's doing it. So many in fact, that asking about one's holiday upon return is almost pointless. Everyone has been there, seen that, and bought the t-shirt. 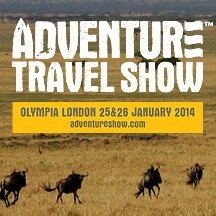 If you really want excitement, and something worth sending home a postcard for, then you should go to the Adventure Travel Show on 25th & 26th January at Kensington Olympia. It is the UK's only event dedicated to 'experiences off the beaten track'. They offer small group adventures, safari, trekking, exploratory journeys, career break projects, and more. Would you like to travel to remote destinations, get intimate with wildlife, or go on an exclusive expedition? If so, book tickets to the Adventure travel show; prices are as follow - tickets in advance £8, weekend ticket in advance £12, on the door £10 and weekend ticket on the door £15. You will get to meet the biggest collection of specialist adventure travel companies in the business, choose from over a hundred inclusive inspirational talks, enhance your photography skills, get great discounts, and start planning the trip of a lifetime. Hear talks on mountaineering, listen to incredible stories from seasoned travellers, or attend a writing seminar, in which you can improve your travel writing skills for journals, books, and newspapers. The perfect guide for future journalists.